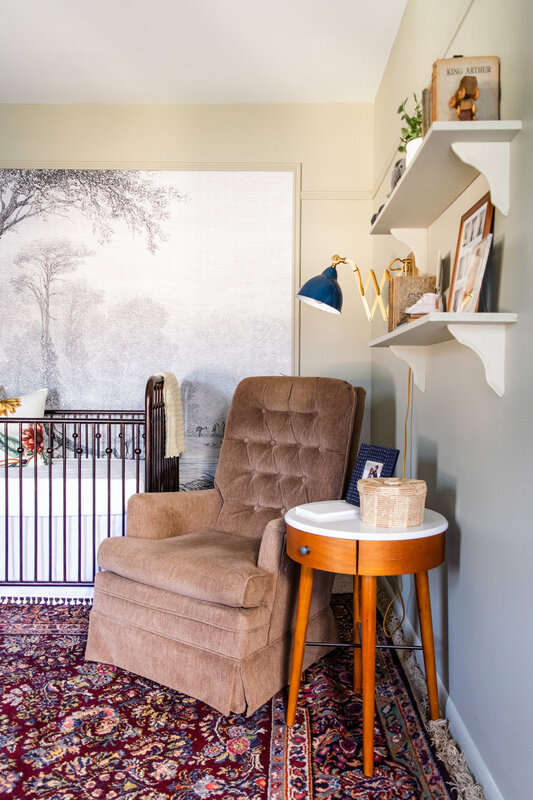 The Nursery Reveal! 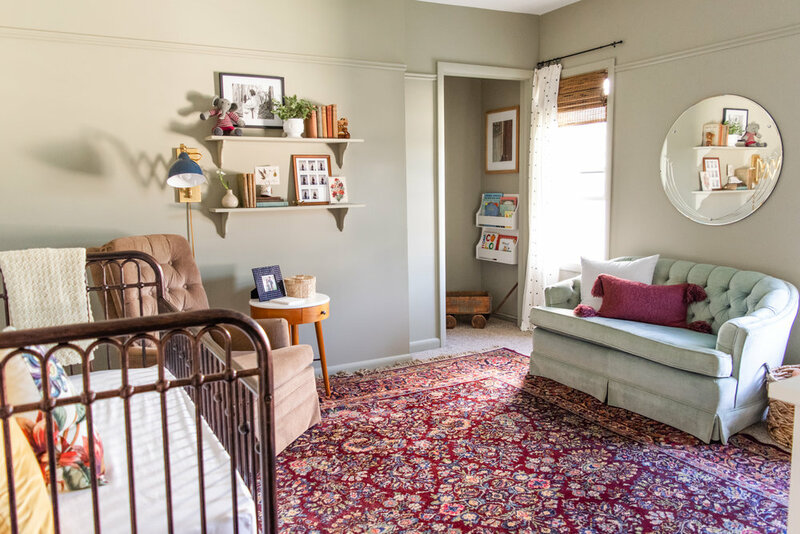 | One Room Challenge Week 6 — Stevie Storck Design Co.
We did it! Our daughter's nursery is officially complete and ready for her arrival in approximately 3 more weeks. 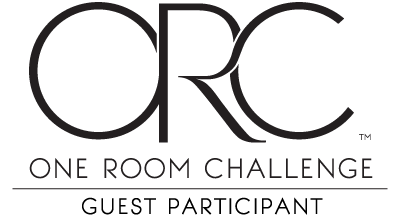 It's Week 6 and reveal day for the Spring 2018 One Room Challenge. I can't wait to show you around! The starting point was definitely the crib. I had my sights on either a vintage style crib and once I saw this oil-rubbed bronze beauty, I knew it had to be the one. I love that it looks like it could be antique, but is still pretty simple. The single row of decorative balls feels like a modern take on the traditional ornate styling of wrought iron cribs. 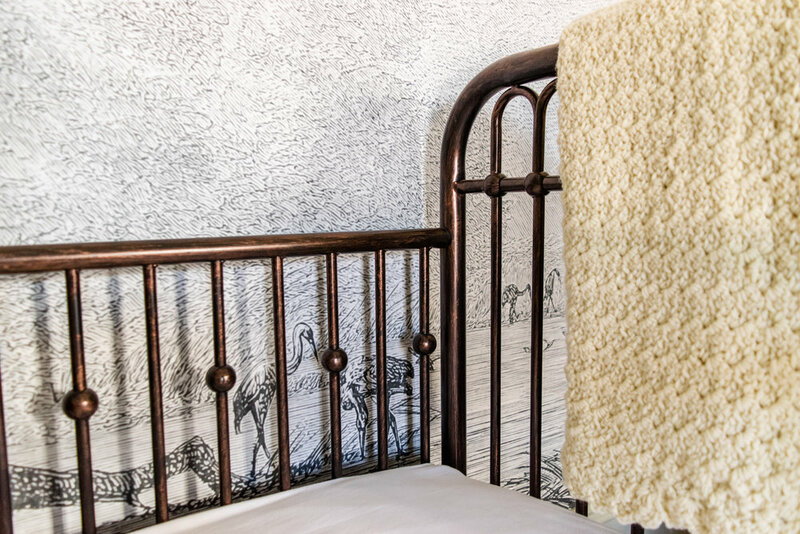 I wanted the crib wall to really become the main feature of the room and got the idea that a black and white wallpaper mural would be just the way to do that. I'm thrilled to have partnered with Walls Republic for the One Room Challenge on this stunning custom wallpaper mural! Walls Republic is a great resource with thousands of modern, stylish wallpapers and murals to choose from. They also offer a "Create Your Own" mural option, where you can have any image from Shutterstock made into a custom sized wallpaper mural. Anthony and I chose this beautiful 19th century engraving because of the gorgeous details and the little storks wading in the water. Ok, they might be herons, but our last name is Storck so it just felt too perfect! Through Walls Republic I was able to customize the size to fit our room and have it printed in greyscale (the original image had some slight sepia tones) onto high quality non-woven paper. Our friend and neighbor Janie Reeves of Design2Finish generously installed it for us and with Anthony's help they had it up in under an hour. If you're local to PA, MD or northern VA and in need of a fantastic painter and wallpaper hanger, she's your woman! A big thank you to both Walls Republic and Janie, the mural is truly a showstopper and our favorite part of the room! In addition to framing the mural out with simple chair rail moulding, we continued the same moulding around the perimeter of the room as a faux picture rail for a little architectural interest. Anthony had never done and finish carpentry before, but he figured it out quickly and got it done in just a couple of evenings last week. And he said he had fun doing it too, so maybe there'll be some more decorative moulding projects to come at the Storck Home! 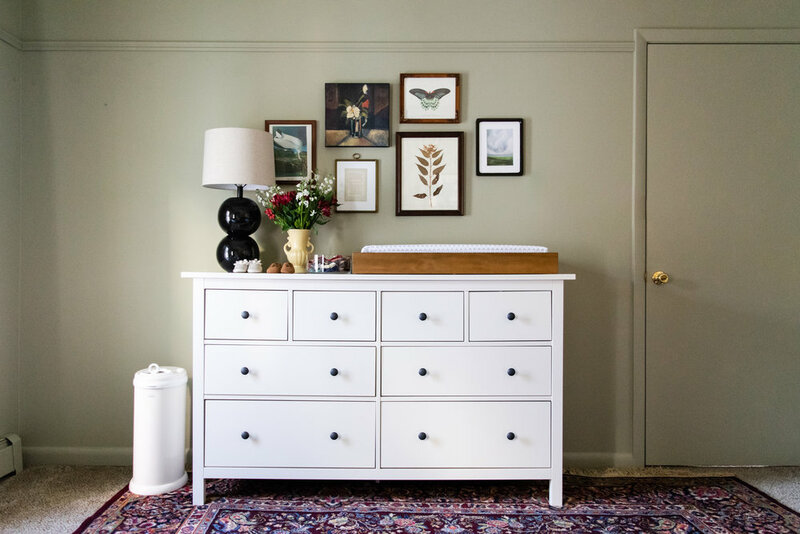 We painted all the trim, baseboards and the interior of the door the same color as the walls - Farrow & Ball's French Gray - to give the room a really cozy, cocoon-like feel. 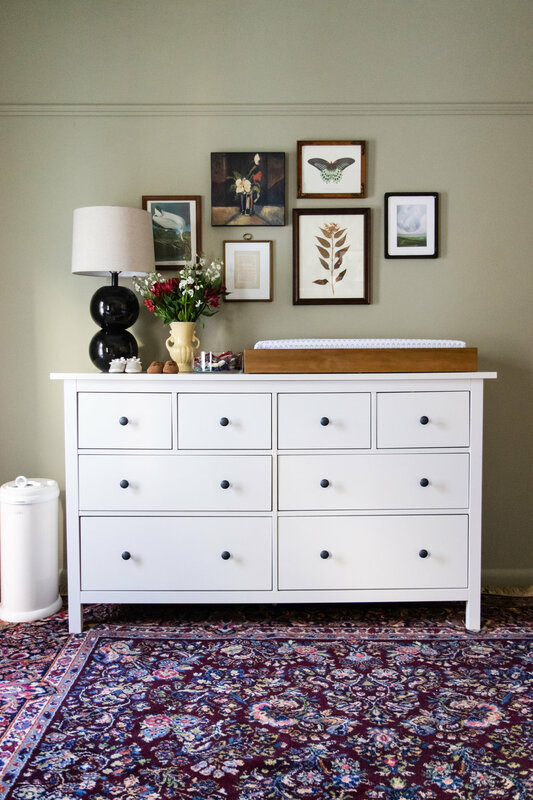 For the main storage piece in this room, we reused an IKEA dresser that we had bought for our last apartment. Instead of a separate changing table, we topped it with a wooden changing tray and pad insert. I was originally thinking of a white tray, but I'm glad I went with the wood for a little warmth and contrast on this side of the room! Over the course of my pregnancy, I had slowly been collecting artwork for the nursery. Everything is vintage except for the Emily Jeffords print on the far right - I love her work! The small piece in the brass frame is a page from a vintage book of Whittier poetry that was falling apart. I actually used a floral illustration from the same book to decorate the shelves on the other side of the room. Instead of making the gallery wall cohesive with matching frames, I decided to keep the eclectic look going by taking a list of the sizes I needed to Salvation Army and seeing what I could find. I came home with a mix of wood, black and brass frames, none of which cost most than 99 cents! I know I said the mural was my favorite part of the room, but really we have so many favorite parts of this room it's hard to just pick one! This vintage velvet settee was a yard sale find a few years ago, and actually Anthony was the one who spotted it! Despite it's petite size, it is so so comfortable. Even our boxer, Chloe loves it! I imagine spending a lot of time between this settee and our rocker, cuddled up with our little girl. The antique mirror above it was another lucky secondhand find. The closet in this room is pretty funky. It's kind of like a long and narrow walk-in, with 3 big "steps" that cover the slant of the stairwell ceiling below. There was no rod or shelving when we moved in and we decided to install the storage on the very back wall to make the best use of all the space back there. You can see a progress photo of the closet organization here. I had always planned on hanging a bookshelf on this shallow side wall of the closet, but on Sunday Anthony suggested that we remove the closet door and paint the interior of the closet to feel like an extension of the room. I'm so glad he did because I love this little nook so much more now! On the fourth wall, we built simple shelves using primed MDF boards and pine brackets from Lowe's. We painted them the same color as the walls and trim because I wanted the items on the shelves to be the focus. I styled them out with a collection of vintage finds, a couple photos (including my nearly complete polaroid baby bump pictures!) and an adorable handmade elephant doll gifted to use by a friend. Next to the shelves, we hung a plug in wall sconce for reading bed time stories and late night nursing sessions. The rocker was a $30 Facebook Marketplace find, that was originally purchased as a placeholder but since has really grown on us! It's a little dated, but the high back makes it super comfy and we don't plan to replace it anytime soon. I've already spent a lot of mornings rocking in this chair and thinking about what it will be like when our baby girl is here! Designing and creating this room has really been a dream come true! Anthony and I both love spending time in here and we're so glad we hopped on board with the One Room Challenge this go round. It feels so good to have a beautiful room prepared just for our little one. We are so looking forward to all the time we'll be spending in here as a family in just a few short weeks! 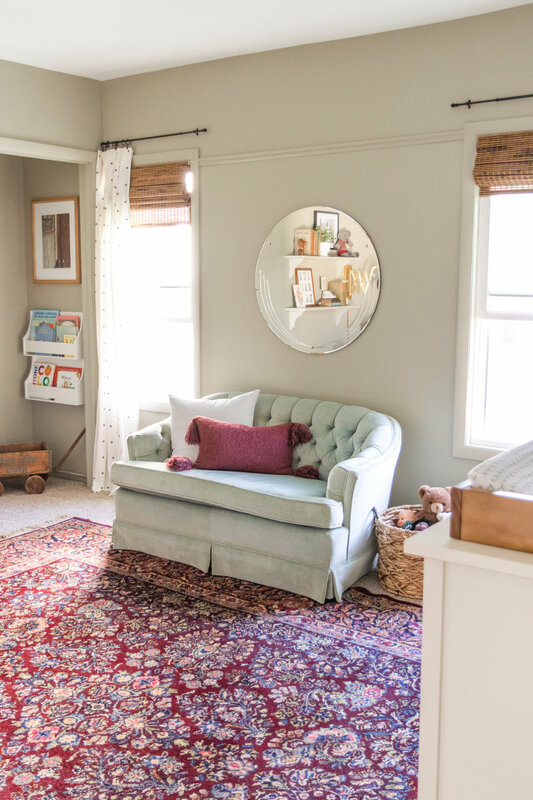 There are so many amazing One Room Challenge room reveals to see! The 20 featured bloggers are linked below and you can browse the 200+ guest participant room reveals right here. Thanks for following along!